​We can offer you a wide array of services. 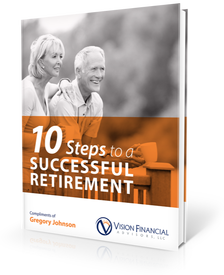 At Vision Financial Advisors we believe that a plan is a powerful tool. Reaching your long-term financial objectives hinges on having the right plan — one that fits your unique circumstances and grows with you. Our mission is to help our clients realize greater clarity with a focus on achieving financial success. Estate planning involves the arrangement of financial affairs that, in the unlikely event of death, helps minimize financial losses. This type of policy covers basic daily needs over an extended time. While health care insurance or Medicare helps pay for immediate medical expenses, say, a surgeon's bill, long-term-care insurance helps people cope with the cost of chronic illnesses, such as Alzheimer's disease, or various disabilities. The policies pay for assistance with everything from the basics — bathing and dressing — to skilled care from therapists and nurses for months or even years. We offer affordable revocable trusts, prepared by licensed practicing attorneys, and offer our expertise and assistance in transferring your assets into your trust so that legal fees and court costs will be avoided at death. We offer a variety of life insurance strategies to help your loved ones in the event of your death. To put it simply, life insurance helps protect those who depend on your paycheck. If you die prematurely, life insurance helps provide your dependents with ongoing income to replace yours, until (or unless) they can live comfortably without it. It can also help provide a timely emergency fund for medical, legal, and funeral costs, should family savings not be adequate to cover them. 35 percent* of Americans already over the age of 65 rely almost entirely on Social Security payments alone. What are you doing each month to ensure that you have the needed income for retirement? We can help. Give us a call at​ ​​480.833.1553!